For other uses, see Baal (disambiguation). Baal (/ˈbeɪəl, ˈbɑːəl/),[a] properly Baʿal,[b] was a title and honorific meaning "owner," "lord" in the Northwest Semitic languages spoken in the Levant during antiquity. From its use among people, it came to be applied to gods. Scholars previously associated the theonym with solar cults and with a variety of unrelated patron deities, but inscriptions have shown that the name Baʿal was particularly associated with the storm and fertility god Hadad and his local manifestations. The spelling of the English term "Baal" derives from the Greek Báal (Βάαλ), which appears in the New Testament and Septuagint, and from its Latinized form Baal, which appears in the Vulgate. These forms in turn derive from the vowel-less Northwest Semitic form BʿL (Phoenician & Punic: 𐤁𐤏𐤋). The word's biblical senses as a Phoenician deity and false gods generally were extended during the Protestant Reformation to denote any idols, icons of the saints, or the Catholic Church generally. In such contexts, it follows the anglicized pronunciation and usually omits any mark between its two As. In close transliteration of the Semitic name, the ayin is represented, as Baʿal. In the Northwest Semitic languages—Ugaritic, Phoenician, Hebrew, Amorite, and Aramaic—the word baʿal signified "owner" and, by extension, "lord", a "master", or "husband". Cognates include the Akkadian Bēlu (𒂗),[c] Amharic bal (ባል), and Arabic baʿl (بَعْل). Báʿal (בַּעַל) and baʿl still serve as the words for "husband" in modern Hebrew and Arabic respectively. They also appear in some contexts concerning the ownership of things or possession of traits. 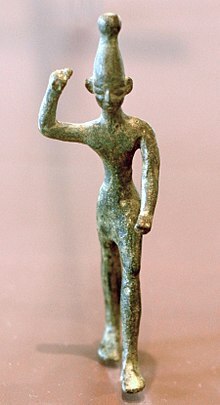 Bronze figurine of a Baal, 14th – 12th century BCE, found at Ras Shamra (ancient Ugarit) near the Phoenician coast. Musée du Louvre. Baʿal was also used as a proper name by the third millennium BCE, when he appears in a list of deities at Abu Salabikh. Most modern scholarship asserts that this Baʿal—usually distinguished as "The Lord" (הבעל, Ha Baʿal)—was identical with the storm and fertility god Hadad; it also appears in the form Baʿal Haddu. Scholars propose that, as the cult of Hadad increased in importance, his true name came to be seen as too holy for any but the high priest to speak aloud and the alias "Lord" ("Baʿal") was used instead, as "Bel" was used for Marduk among the Babylonians and "Adonai" for Yahweh among the Israelites. A minority propose that Baʿal was a native Canaanite deity whose cult was identified with or absorbed aspects of Adad's. Regardless of their original relationship, by the 1st millennium BCE, the two were distinct: Hadad was worshipped by the Aramaeans and Baʿal by the Phoenicians and other Canaanites. Baʿal is well-attested in surviving inscriptions and was popular in theophoric names throughout the Levant but he is usually mentioned along with other gods, "his own field of action being seldom defined". Nonetheless, Ugaritic records show him as a weather god, with particular power over lightning, wind, rain, and fertility. [d] The dry summers of the area were explained as Baʿal's time in the underworld and his return in autumn was said to cause the storms which revived the land. Thus, the worship of Baʿal in Canaan—where he eventually supplanted El as the leader of the gods and patron of kingship—was connected to the regions' dependence on rainfall for its agriculture, unlike Egypt and Mesopotamia, which focused on irrigation from their major rivers. Anxiety about the availability of water for crops and trees increased the importance of his cult, which focused attention on his role as a rain god. He was also called upon during battle, showing that he was thought to intervene actively in the world of man, unlike the more aloof El. The Lebanese city of Baalbeck was named after Baal. The Baʿal of Ugarit was the epithet of Hadad but as the time passed, the epithet became the god's name while Hadad became the epithet. Baʿal was usually said to be the son of Dagan, but appears as one of the sons of El in Ugaritic sources. [e] Both Baʿal and El were associated with the bull in Ugaritic texts, as it symbolized both strength and fertility. The virgin goddess ʿAnat was his sister and sometimes credited with a child through him. He held special enmity against snakes, both on their own and as representatives of Yammu (lit. "Sea"), the Canaanite sea god and river god. He fought the Tannin (Tunnanu), the "Twisted Serpent" (Bṭn ʿqltn), "Litan the Fugitive Serpent" (Ltn Bṭn Brḥ, the biblical Leviathan), and the "Mighty One with Seven Heads" (Šlyṭ D.šbʿt Rašm). 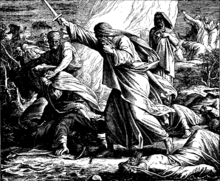 [f] Baʿal's conflict with Yammu is now generally regarded as the prototype of the vision recorded in the 7th chapter of the biblical Book of Daniel. As vanquisher of the sea, Baʿal was regarded by the Canaanites and Phoenicians as the patron of sailors and sea-going merchants. As vanquisher of Mot, the Canaanite death god, he was known as Baʿal Rāpiʾuma (Bʿl Rpu) and regarded as the leader of the Rephaim (Rpum), the ancestral spirits, particularly those of ruling dynasties. From Canaan, worship of Baʿal spread to Egypt by the Middle Kingdom and throughout the Mediterranean following the waves of Phoenician colonization in the early 1st millennium BCE. He was described with diverse epithets and, before Ugarit was rediscovered, it was supposed that these referred to distinct local gods. However, as explained by Day, the texts at Ugarit revealed that they were considered "local manifestations of this particular deity, analogous to the local manifestations of the Virgin Mary in the Roman Catholic Church". In those inscriptions, he is frequently described as "Victorious Baʿal" (Aliyn or ẢlỈyn Baʿal), "Mightiest one" (Aliy or ʿAly)[g] or "Mightiest of the Heroes" (Aliy Qrdm), "The Powerful One" (Dmrn), and in his role as patron of the city "Baʿal of Ugarit" (Baʿal Ugarit). As Baʿal Zaphon (Baʿal Ṣapunu), he was particularly associated with his palace atop Jebel Aqra (the ancient Mount Ṣapānu and classical Mons Casius). He is also mentioned as "Winged Baʿal" (Bʿl Knp) and "Baʿal of the Arrows" (Bʿl Ḥẓ). Phoenician and Aramaic inscriptions describe Bʿl Krntryš, "Baʿal of the Lebanon" (Bʿl Lbnn), "Baʿal of Sidon" (Bʿl Ṣdn), Bʿl Ṣmd, "Baʿal of the Heavens" (Baʿal Shamem or Shamayin), Baʿal ʾAddir (Bʿl ʾdr), Baʿal Hammon (Baʿal Ḥamon), Bʿl Mgnm. Baʿal Hammon was worshipped in the Tyrian colony of Carthage as their supreme god. It is believed that this position developed in the 5th century BCE following the severing of its ties to Tyre following the 480 BCE Battle of Himera. Like Hadad, Baʿal Hammon was a fertility god. Inscriptions about Punic deities tend to be rather uninformative, though, and he has been variously identified as a moon god and as Dagan, the grain god. Rather than the bull, Baʿal Hammon was associated with the ram and depicted with his horns. The archaeological record seems to bear out accusations in Roman sources that the Carthaginians burned their children as human sacrifices to him. He was worshipped as Baʿal Karnaim ("Lord of the Two Horns"), particularly at an open-air sanctuary at Jebel Bu Kornein ("Two-Horn Hill") across the bay from Carthage. His consort was the goddess Tanit. The epithet Hammon is obscure. Most often, it is connected with the NW Semitic ḥammān ("brazier") and associated with a role as a sun god. Renan and Gibson linked it to Hammon (modern Umm el-‘Amed between Tyre in Lebanon and Acre in Israel) and Cross and Lipiński to Haman or Khamōn, the classical Mount Amanus and modern Nur Mountains, which separate northern Syria from southeastern Cilicia. The title baʿal was a synonym in some contexts of the Hebrew adon ("Lord") and adonai ("My Lord") still used as aliases of the Lord of Israel Yahweh. According to some scholars, the early Hebrews did use the names Baʿal ("Lord") and Baʿali ("My Lord") in reference to the Lord of Israel, just as Baʿal farther north designated the Lord of Ugarit or Lebanon. This occurred both directly and as the divine element of some Hebrew theophoric names. However, according to others it is not certain that the name Baal was definitely applied to Yahweh in early Israelite history. The component Baal in proper names is mostly applied to worshippers of Baal, or descendants of the worshippers of Baal. Names including the element Baʿal presumably in reference to Yahweh include the judge Gideon (also known as Jerubaʿal, lit. "The Lord Strives"), Saul's son Eshbaʿal ("The Lord is Great"), and David's son Beeliada ("The Lord Knows"). The name Bealiah ("The Lord is Jah"; "Yahweh is Baʿal") combined the two. However John Day states that as far as the names Eshba’al, Meriba’al, and Beeliada (that is Baaliada), are concerned it is not certain whether they simply allude to the Cannanite god Ba’al, or are intended to equate Yahweh with Ba’al, or have no connection to Ba’al. Eshbaʿal became Ish-bosheth and Meribaʿal became Mephibosheth, but other possibilities also occurred. Beeliada is mentioned renamed as Eliada and Gideon's name Jerubaʿal was mentioned intact but glossed as a mockery of the Canaanite god, implying that he strove in vain. Direct use of Baʿali continued at least as late as the time of the prophet Hosea, who reproached the Israelites for doing so. Baʿal Berith ("Lord of the Covenant") was a god worshipped by the Israelites when they "went astray" after the death of Gideon according to the Hebrew Scriptures. The same source relates that Gideon's son Abimelech went to his mother's kin at Shechem and received 70 shekels of silver "from the House of Baʿal Berith" to assist in killing his 70 brothers from Gideon's other wives. An earlier passage had made Shechem the scene of Joshua's covenant between all the tribes of Israel and "El Yahweh, our god of Israel" and a later one describes it as the location of the "House of El Berith". It is thus unclear whether the false worship of the "Baʿalim" being decried is the worship of a new idol or the continued worship of Yahweh, but by means of rites and teachings taking him to be a mere local god within a larger pantheon. The Hebrew Scriptures record the worship of Baʿal threatening Israel from the time of the Judges until the monarchy. The Deuteronomist and the present form of Jeremiah seem to phrase the struggle as monolatry or monotheism against polytheism. However, Yahweh is firmly identified in the Hebrew Scriptures with El Elyon, whose Canaanite figure appears hostile to the cult of Baʿal even in the polytheistic accounts of Ugarit[which?] and the Phoenician cities. "Beelzebub" in the 1863 edition of Jacques Collin de Plancy's Dictionnaire Infernal. And Elias was most surely of the messengers. He asked his people: 'Do you not fear [God]? Will ye call upon Baal and forsake the best of creators? God is your Lord and the Lord of your fathers, the ancients' But they rejected him, and they will certainly be called up [for punishment], except the sincere and devoted servants of God [among them], and we left [this blessing] for him among generations [to come] in later times, peace be upon Elias. ^ The American pronunciation is usually the same but some speakers prefer variants closer to the original sound, such as /bɑːˈɑːl/ or /bɑːl/. ^ Ugaritic: 𐎁𐎓𐎍; Phoenician: 𐤁𐤏𐤋; Biblical Hebrew: בעל‎, pronounced [baʕal]). ^ This cuneiform is identical to the ⟨ 𒂗 ⟩ which is taken as EN in Sumerian texts. There, it has the meaning "high priest" or "lord" and appears in the names of the gods Enki and Enlil. ^ In surviving accounts, Baʿal's power over fertility extends only over vegetation. Older scholarship claimed Baʿal controlled human fertility as well, but did so on the basis of misinterpretation or of inscriptions now regarded as dubious. Similarly, 19th-century scholarship treating Baal as a personification of the sun seems to have been badly taken. The astrotheology of Near Eastern deities was an Iron Age development long postdating the origin of religion and, following its development, Bel and Baʿal were associated with the planet Jupiter. The sun was worshipped in Canaan as either the goddess Shapash or the god Shamash. ^ Herrmann argues against seeing these separate lineages literally, instead proposing that they describe Baʿal's roles. As a god, he is understood as a child of El, "father of gods", while his fertility aspects connect him to the grain god Dagan. ^ The account is patchy and obscure here. Some scholars take some or all of the terms to refer to Litan and in other passages ʿAnat takes credit for destroying the monsters on Baʿal's behalf. Herrmann takes "Šalyaṭu" as a proper name rather than translating it as the "powerful one" or "tyrant". ^ This name appears twice in the Legend of Keret discovered at Ugarit. Before this discovery, Nyberg had restored it to the Hebrew texts of Deuteronomy, 1 & 2 Samuel, Isaiah, and Hosea. Following its verification, additional instances have been claimed in the Psalms and in Job. 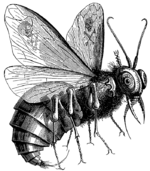 ^ "The etymology of Beelzebul has proceeded in several directions. The variant reading Beelzebub (Syriac translators and Jerome) reflects a long-standing tradition of equating Beelzebul with the Philistine deity of the city of Ekron mentioned in 2 Kgs 1:2, 3, 6, 16. Baalzebub (Heb ba˓al zĕbûb) seems to mean “lord of flies” (HALAT, 250, but cf. LXXB baal muian theon akkarōn, “Baal-Fly, god of Akkaron”; Ant 9:2, 1 theon muian)." ^ Arndt & al. reverse this, saying Symmachus transcribed Baälzeboúb for a more common Beëlzeboúl. ^ "It is more probable that b‘l zbl, which can mean “lord of the (heavenly) dwelling” in Ugaritic, was changed to b‘l zbb to make the divine name an opprobrius epithet. The reading Beelzebul in Mt. 10:25 would then reflect the right form of the name, a wordplay on “master of the house” (Gk oikodespótēs)." ^ "An alternative suggested by many is to connect zĕbûl with a noun meaning '(exalted) abode.'" ^ "In contemporary Semitic speech it may have been understood as ‘the master of the house’; if so, this phrase could be used in a double sense in Mt. 10:25b." ^ "In NT Gk. beelzeboul, beezeboul (Beelzebub in TR and AV) is the prince of the demons (Mt. 12:24, 27; Mk. 3:22; Lk. 11:15, 18f. ), identified with Satan (Mt. 12:26; Mk. 3:23, 26; Lk. 11:18)." ^ "Besides, Matt 12:24; Mark 3:22; Luke 11:15 use the apposition ἄρχων τῶν δαιμονίων ‘head of the →Demons’." ^ a b Oxford English Dictionary (1885), "Baal, n."
^ De Moor & al. (1987), p. 1. ^ a b c Smith (1878), pp. 175–176. ^ a b AYBD (1992), "Baal (Deity)". ^ a b c d e f g h i Herrmann (1999a), p. 132. ^ Huss (1985), p. 561. ^ Oxford English Dictionary (1885), "Baalist, n."
^ a b c d Pope (2006). ^ a b c d e f DULAT (2015), "bʕl (II)". ^ Kane (1990), p. 861. ^ a b Strong (1890), H1172. ^ Wehr & al. (1976), p. 67. ^ Belin, in Gilles Ménage, Dictionnaire étymologique de la langue françoise, 1750. Ménage constructs a derivation of both the "Chaldean" Bel and the Celtic Belin from a supposed word for "ball, sphere", whence "head", and "chief, lord"
^ Halpern (2009), p. 64. ^ a b Day (2000), p. 68. ^ Ayali-Darshan (2013), p. 652. ^ a b c d e Herrmann (1999a), p. 133. ^ a b c d Herrmann (1999a), p. 134. ^ Herrmann (1999a), pp. 134–135. ^ Smith & al. (1899). ^ Allen, Spencer L (2015). The Splintered Divine: A Study of Istar, Baal, and Yahweh Divine Names and Divine Multiplicity in the Ancient Near East. p. 216. ISBN 9781614512363. ^ Miller (2000), p. 32. ^ a b c d e f Herrmann (1999a), p. 135. ^ Uehlinger (1999), p. 512. ^ Collins (1984), p. 77. ^ Isa. 59:18 & 63:7. ^ a b Herrmann (1999a), pp. 132–133. ^ "Baal | ancient deity". Encyclopedia Britannica. Retrieved 2017-08-04. ^ Moscati (2001), p. 132. ^ Lancel (1995), p. 197. ^ Lancel (1995), p. 195. ^ Walbank (1979), p. 47. ^ Gibson (1982), p. 39 & 118. ^ Cross (1973), p. 26–28. ^ Lipiński (1994), p. 207. ^ a b Josephus, Antiquities, 8.13.1. ^ a b c BEWR (2006), "Baal". ^ Day (2000), p. 75. ^ Herrmann (1999a), p. 136. ^ Ayles (1904), p. 103. ^ Day (2000), p. 72. ^ Kelle (2005), p. 137. ^ a b Jgs. 8:33–34. ^ Smith (2002), Ch. 2. ^ a b Arndt & al. (2000), p. 173. ^ Balz & al. (2004), p. 211. ^ a b AYBD (1992), "Beelzebul". ^ Lurker (1987), p. 31. ^ a b Herrmann (1999b). ^ a b Bruce (1996). ^ Milton, Paradise Lost, Bk. 1, ll. 419–423. Easton, Matthew George, ed. (1893), Illustrated Bible Dictionary and Treasury of Biblical History, Biography, Geography, Doctrine, and Literature with Numerous Illustrations and Important Chronological Tables and Maps, New York: Harper & Bros.
Souvay, Charles (1907), "Baal, Baalim", Catholic Encyclopedia, Vol. II, New York: Robert Appleton Co.
Wikisource has the text of the 1911 Encyclopædia Britannica article Baal. "Baal" . New International Encyclopedia. 1905.